The location of the Nudge Nudge Wink Wink sketch. Description: This weird Indian restaurant was until 2006 a pleasant pub called The Torrington. The pub was famous for the Monty Python's Flying Circus sketch Nudge Nudge Wink Wink (also called Candid Photography). 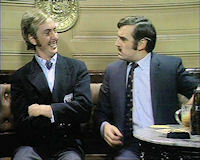 The sketch featured Eric Idle and Terry Jones as two strangers who meet in a pub. Idle (playing a young man) asks Jones (the elder chap) several questions about his relationship with his wife, all bearing questionable sexual innuendo (Does your wife 'go'?, is she a sport?, is she interested in photography?, etc.). Jones responds in a confused, non-committal sort of way, and Idle responds with an enthusiastic Nudge, Nudge, Say no more. The punchline of course being that after a period of time, Jones demands to know what Idle is talking about. Idle then asks if Jones has slept with a lady and Jones replies that he has, and Idle, fascinated, asks What's it like?